Cheeky Fundraising Ideas for Christmas Jumper Season! 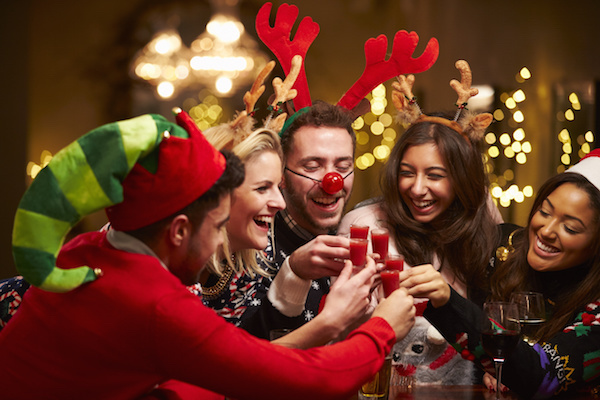 You read it right – ‘tis the season for Christmas jumpers, and we have some cracking Christmas fundraising tips to help you make the most of your festive sweater. Come on, admit it. Somewhere at the back of your cupboard there’s a bright and cheerful sweater with a hint of tinsel, right? Most of us have a Christmas jumper, and much as we might protest, we all secretly love the excuse to get into the mood. There’s even an official Christmas Jumper Day on 15th December, a day when it’s permissible (some would say mandatory) to wear a festive knit with bells on – literally! Christmas Jumper Day was originally claimed by the fabulous charity Save the Children, but it’s since become a national tradition, with people seizing the opportunity to look daft to raise money for whichever good cause is closest to their hearts. So here’s how to make the most of the fun, and raise the feelgood bar for charity. When? Don’t feel limited to just one day, or any day in particular. You’ll see people dressed up in baubles throughout December, so pick a day that works for your office, school or social get-together, and wear it loud and proud. What to wear? Anything festive; if you’re too shy for a jumper, a simple Santa hat also gives the message that you’re joining in with Christmas jumper day. And for the endlessly stylish, there are even classic, understated tops that give a nod to the sentiment, but with more glamour than cheese. Last year Matalan made a Christmas jumper complete with real fairy lights, or you can get a minimalist but feisty festive sweatshirt from Selfish Mother. Hold a bake sale and have a competition for the most festively decorated cake. Sell handmade Christmas decorations, or Christmas cards – once people are in the festive mood, they’re usually happy to make extra purchases ahead of the big day. Take it to the gym: why not ask your Body Pump class if they’re prepared to do a class in a Christmas jumper? Just make sure there’s plenty of water on hand! Go the whole hog with a full outfit: schools could ask for a donation to see the head teacher dressed as Santa all day, or at work you could sponsor the boss to deliver a sales pitch dressed as a Christmas pudding. Play a rugby or football match in matching team Christmas jumpers. Don’t leave your pets out: the Christmas jumper phenomenon has reached such notoriety that you can even buy an outfit for your dog – complete with a reindeer headband! Why not hold a festive fundraising sponsored walk with other dog lovers in your area? At the office: you can really go to town in the workplace. Think about what your team likes. What will motivate them to double their donation? A silly dare, a pub-crawl, or a raffle? Perhaps you could combine your charity day with the annual Christmas party and make an event to really remember. If you have an office charity, take the opportunity to get someone in to give an update – an in person thank you is always very powerful, and makes people want to keep donating. Or ask your team to nominate a charity, and split the amount raised between all their suggestions. And don’t forget about how people will donate – payroll giving for regular donations is becoming very popular as a tax-efficient way of giving to charity, so encourage your staff to sign up. At school: schools are always very busy in the run up to Christmas, with lots for parents and teachers to remember. If holding a separate Christmas jumper day feels like too much, why not make it an added extra at the Christmas fair? Or turn it into a fun art activity by asking children to bring in an old top to decorate in school with fabric paints, tinsel and sequins. With friends: are you planning a Christmas lunch, or evening out? You could turn that into a Christmas Jumper fundraising initiative. You could even turn it into a competition for the best jumper, organise a Secret Santa with an added donation, or hold a raffle. Whatever you decide to do, make sure you advertise it well. You need as many people as possible excited for the event, and joining in. Make a social media post for Facebook or Twitter, and ask people to share it. Add the hashtag #ChristmasJumperDay so even more people see your post. If you can make a great image that’s cute or funny, you might even make the post go viral! People always donate more to causes that resonates with them. Tell the story of your charity with emotion and personal anecdotes, and use statistics to paint the picture of why you do what you do. For example, every single day seven young people are diagnosed with cancer, or every night over 4,000 people sleep rough on the streets in England – that’s more than double the number in 2010. Explain what a donation will go towards. Whatever your charity, there’s a powerful reason to fundraise for it. You know what that reason is – make sure others do too. The usual donation for wearing a Christmas jumper is £2 in the tin, but don’t stop there. Add a contactless giving option if you can, and set up a giving page where people can pledge online donations. Sell cakes or drinks in the office canteen and invite people to bring along a contribution. Once your event or day is over, don’t let the fun stop there. People love to see themselves having fun, so share pictures of your day on a Facebook page, or in your weekly newsletter. One of our favourite tweets from 2016 is the one of Andy Murray playing up to his stereotype. Remember to add a link to your online giving page to prompt last-minute donations. Bah! Humbug! Do you know someone who hates forced fun, and dressing up? Ask them to make an extra donation to get out of it. Perhaps they’d even be willing to mount their own sponsored challenge to avoid looking silly! · Practical guidance on handling charity donations. · Guide to raffles and lotteries. · Eight Steps to Primary School Fundraising Success.